There are a few simple techniques that ensure turning out a perfect pancake every time. In many ways, making pancakes couldn’t be simpler – at their most basic level, they consist only of flour, leavening, eggs, liquid (most often in the form of milk or buttermilk), and sometimes melted butter or oil. But there are a few simple techniques that ensure turning out a perfect pancake every time. 1. Combine the dry ingredients first, then mix the liquid ingredients with the dry ingredients gently with a flexible spatula, just until evenly moistened. Avoid overmixing the batter, which can result in tough, rubbery pancakes. 2. Use the right pan and amount of oil. 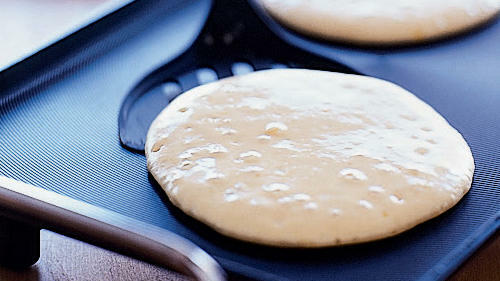 The outside texture of the pancake depends on the surface of the griddle or pan and how much oil you use. While some people prefer the dark rings produced by a cast-iron surface, we like the results of a nonstick surface that has been coated with oil, then quickly wiped nearly clean with a paper towel. 3. Heat the pan over medium-high heat until a small dollop of batter dropped in makes a sizzling noise. Lower the heat, add the first pancake, and observe how it cooks: By the time the edges of the pancake start to look dry and bubbles are forming and popping on top, the underside should be golden brown. Lower the heat if the pancake darkens too fast and raise it if the pancake is still too light when bubbles form.